The Toyo M157 is a premium, free-rolling axle tire designed for long haul, over the highway operations. Created using proprietary e-balance technology, this uniform and consistent tire delivers improved fuel economy while fighting irregular wear. 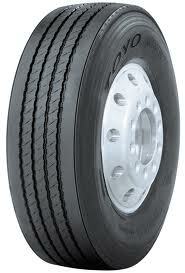 The Toyo M157 is an EPA SmartWay verified, low rolling resistant tire. Click here to learn more about the EPA SmartWay program and how you can save fuel and reduce emissions.